Even as housing prices are continuing to rise around the country, some houses are going up for sale for unimaginably low prices – $1,000, $500 and even a dollar. But even those stunt prices don’t alter the fact that paying cash for a quick buy on a cheap property may end up yielding less than a financed purchase of a more expensive one. The infamous “dollar house” in Detroit is actually listed for sale for just one measly buck. But even tat that rock bottom price, nobody’s biting. The Detroit house is one of a number of properties up for sale in markets around the country for ridiculously low prices, as owners try anything just to get these homes off their hands. But as prospective buyers realize, that nominal price is only the tip of the iceberg. 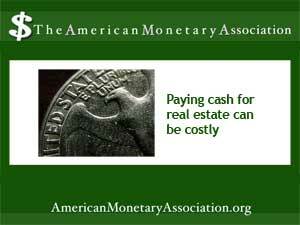 Taking care of the associated fees and ongoing costs can run cost thousands. Transaction fees associated with a home purchase still apply; even if a buyer can make the purchase out of pocket change. Brokers, title services, as well as local and municipal service fees and registrations can add up quickly. And cash deals miss out on key deductions such as the mortgage interest break. Homeowner’s insurance also takes a bite. Depending on the location, type of property and the kinds of coverage needed, insurance can tack on s significant amount to the annual costs of owning and maintaining a home. And if you live in a particularly disaster—prone area, separate coverage for events such as floods, hurricanes and earthquakes might be needed – at additional costs. Renovations and maintenance eat money. Although there are various reasons for posting the very low “stunt” prices on a home, a very cheap house is generally a very distressed house, And while investors and home buyers may be able to reap a tidy return after needed cleanups and upgrades are done, that return may be a long time in coming, even though repairs and maintenance are a part of the long list of tax deductions available to property owners.